There are toys sold in petshops but most are suited for small creatures like hamsters or large ones like ferrets or even dogs. 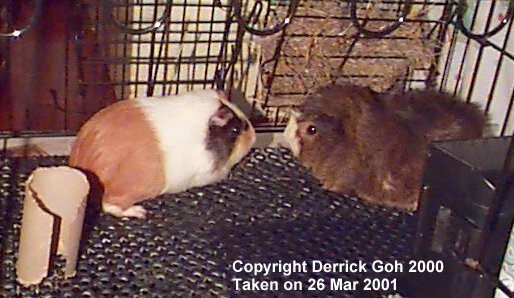 So far I've not seen any toy suitable for cavies being sold in Singapore. I don't know about toys sold overseas though since the selection is much wider. A common toy is what I call the "globe". Its a round plastic ball & you're supposed to put your pet in for it to run. 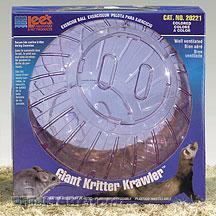 It works on the same principle as a wheel in a hamster cage except this one can actually roll all over your house. Pic of it below. Cavies are not agile creatures & hence these balls are not suitable. Even though you may see pics of cavies in them, it doesn't mean its safe. Some people are ignorant while others don't care & are more concerned about their own amusement. Then you have certain shops or companies who only care about you buying it so they get money. You think they care whether the animal gets injured? I think not! Needless to say, a wheel should never be placed in your cage 'cos cavies are not hamsters! I don't care if the box says for guinea pigs. There's lots of marketing ploys & lies out there. Not everything labelled for cavies are safe for cavies & that's a fact! 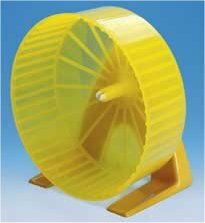 Even a wheel with a flat surface (pictured below) is not safe for cavies. 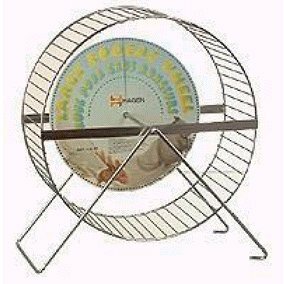 Wheels like the one above with gaps in between should never be used for any animal not even hamsters or chinchillas. 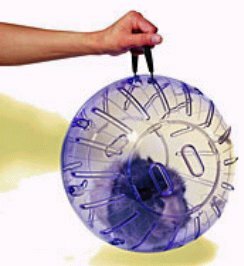 Wheels with flat surface can be given to hamsters & chinchillas but remember, a cavy is NOT a hamster or chinchilla so no wheels! Another toy which I don't quite like is this thing with bells. Apparently its meant for birds who bump it with their beeks & hear the bells ring. Your cavies may think its cute to ring the bell but you never know what they'll do & you wouldn't find it too cute if your cavy decides to attempt to eat the bell! There was also a report about a cavy biting the bell & getting its tooth stuck in between the bell's gap. So no bells! One item every household has is toilet paper & toilet paper rolls make excellent toys. But there are a few precautions to take. Firstly make sure there's no glue on the roll. If there's toilet paper stuck to the roll, that's an indication of glue. Any dark coloured marks? That's probably glue. Choose only toilet rolls that are free of glue. Also, make sure you cut one side of the toilet roll length wise. This is to prevent your cavy from getting trapped inside. You'll be suprised how even a fat cavy can get stuck in a narrow roll! Below is a pic of a toilet roll which has been cut length wise to prevent such accidents from occuring. Since toilet rolls are dirt cheap & can get soiled very easily, replace the roll at least once every 2 weeks. One roll is enough so don't clutter the cage. Someone once suggested using cardboard rolls from facsimile paper or rolls from aluminium foil. Those are too thick & the thicker the roll, the higher the chance of glue being used to hold the roll's layers together. So bad idea! Toilet rolls are still the best. They're colour free & readily available. In the US, a popular toy is brown paper bags. However there are certain draw backs to it. Firstly you need to make sure it is not coloured. Therefore that paper bag you used to take away Burger King food with is out of the question since the BK logo is coloured! Then there's the issue of cleanliness. What if your cavy goes inside the bag, pees & poops inside, comes out & decides to go in to the bag again? It'll be messing around in its own pee & poop. Personally I feel toilet rolls are the safest toys to give, which is why that's the only toy I give my cavies. Chew blocks are not really toys but I don't really know wherelse to put them! Besides I guess cavies do have fun gnawing them so what they heck, a "toy" it is!! No harm trying these but some cavies will ignore them totally or after a while. Commercially produced chew blocks come in different flavours and as the name implies, they are for cavies to chomp on & wear down their teeth. These chews are usually either made from wood or a combination of corn starch & other things to form this rock hard blob. 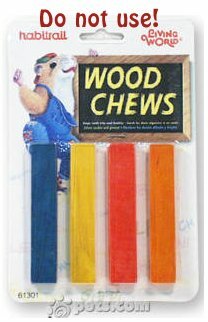 Wooden chews are more common but avoid those that are coloured. Colouring is bad for cavies so never give coloured wooden chews. Flavoured chews should also be avoided since too much artificial flavouring is bad. There are natural wooden chews with no artificial colours or flavours. 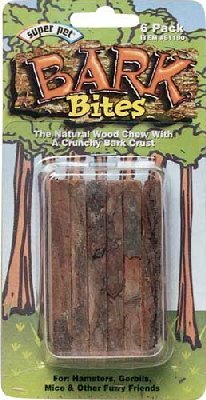 One such natural chew is "SuperPet Bark Bites" (pictured below). They come in 2 sizes & I first saw them at Pet Lovers Centre at Simei. The one I bought was the 6 piece pack which retails for $3.10. "Bark Bites" supposedly contains parts of the cambium layer of a tree. This cambium layer carries nutrients between roots & foliage & is rich in nutrients. If that's true then "Bark Bites" not only help our furry friends wear down their teeth but are also a source of nutrients. However I notice "Bark Bites" tend to be covered with lots of saw dust. Not good when inhaled. So I suggest you brush off as much as you can before giving it to them. Don't use your fingers to brush unless you want to risk getting a splinter! PLC at Simei also sells SuperPet Critter Ka-Bobs which are meant for holding things like apples, carrots, pears, etc just like a shishkabob. If you like you can connect the "Bark Bites" to the Critter Ka-Bob & hang it from the cage. I just leave it on the floor. There's a pic of the Ka-Bob below. Another natural chew is the Superpet Cholla Chews (pictured below) which is supposedly sun dried cactus. I'm not sure how its like compared to Bark Bites but since there's no artificial colouring or flavours, it is safe to give your cavies.